Jane Austen is one of my favorite authors, and Pride and Prejudice, is one of my favorite books. So naturally, whenever a new continuation of Austen’s great works comes out, I simply have to have a look! Where will my favorite characters go this time? How will their lives change? What obstacles will be thrown in their way? 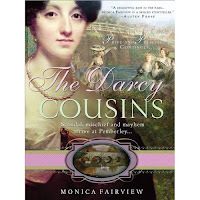 I had the pleasure of reading Monica Fairview’s, The Darcy Cousins, and what an interesting turn she took! One might reasonably expect that a young lady dispatched in disgrace across the Atlantic to England would strive to behave with decorum, but Mr. Darcy's incorrigible American cousin, Clarissa Darcy, manages to provoke Lady Catherine de Bourgh, Mr. Collins, and the parishioners of Hunsford all in one morning! And there are more surprises in store for that bastion of tradition, Rosings Park, when the family gathers for their annual Easter visit. Georgiana Darcy, generally a shy model of propriety, decides to take a few lessons from her unconventional cousin. And Anne de Bourgh, encouraged to escape her "keeper," Mrs. Jenkinson, simply… vanishes! In this tale of friendship, rebellion, and love, two young women entering society forge a strong connection. A connection that is sorely tested when they both set out to win the heart of a most dashing gentleman. One always thinks of Darcy’s sister, Georgiana as a sweet little thing, just coming into her own. Perhaps, they think she is fragile given the horrible ordeal with the wastrel Mr. Wickham. Ms. Fairview, gives Georgiana some confidence, in the way of her cousin, Clarissa. Clarissa is an outrageous, overly confident, fun-loving (and a bit naughty) girl, who comes to visit the family. Together they will come out to society. But Clarissa’s flamboyant behavior does not fit in with the tight-lipped, obsessed with propriety ton, and Georgiana’s been tasked with keeping her in line. While she does try to curb her cousin’s behavior somewhat, Georgiana begins to feel that she herself is stiff, boring and dull, and since Clarissa seems to get a lot of positive male attention, Georgiana thinks, perhaps she ought to emulate her cousin. And for those staunch fans of Elizabeth--some of the things Miss Georgiana does in light of finding herself, may have you clenching your fists! But don't lament! Just keep reading! The twists and turns Ms. Fairview takes us on are a journey unto itself. She wrote a perfect Mr. Collins who irritated me to no end as he should! And Anne de Bourgh! What a fascinating angle! Lady Catherine, still had me gnashing my teeth... And it was very nice to see my all time favorite hero and heroine, Darcy and Elizabeth, still going strong! I enjoyed this story for the moral it gives us in the end, and the lively new characters it brings out. In fact, I would recommend this story for younger readers as well. We have a new hero, Mr. Gatley, who surely encompasses and emanates the “Darcy aura,” as I like to say. From the moment they meet, Georgiana and Gatley spar wits. It was very entertaining to see their story unfold. 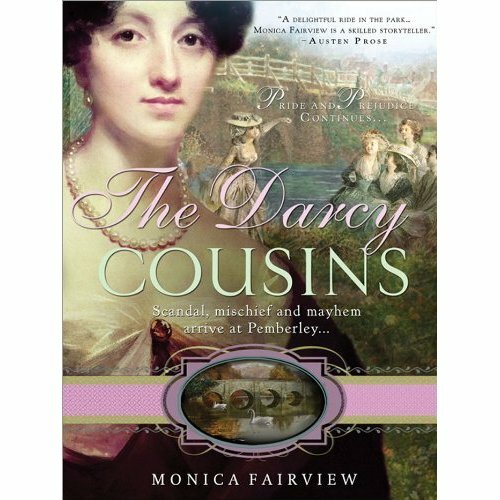 Even though the title is The Darcy Cousins, this is really Georgiana’s story, and with a happy ending that left me smiling. A fun loving story, with characters who pop and come alive on the pages. A unique and engaging approach. If you love Pride and Prejudice continuations, I would recommend reading this book! Don’t forget to come back tomorrow for Monica’s blog post and a chance for two people to win a copy of the book! (US and Canada only). Check the winner’s cube on the top right side of the blog for winners! This sounds like a delightful book. Since so many people hate to leave their favorite characters, it is no surprise that people will want to check in on them. Jane Austen is one of my favorite authors. She was a contemporary of Nancy Storace (the subject of my novel), and died the very same year as Nancy, just weeks apart from one another. I had never heard of any continuations of Austen's books until now, and these characters are among my favorites. I'll be sure to throw my hat in for the drawing tomorrow!